Did you know that the Remodeling Pro can provide you with one of the most popular features in Kitchen remodels today – an appliance caddy? The Remodeling Pro worked on several projects for the Simmons including this kitchen remodel. Our customer had found the cabinets and countertops they wanted as part of their new kitchen. They came to us because of other work we had completed. They found that our work was tasteful, beautiful and done right. They asked us to install the new cabinets and countertops for them. We did. This project added clean simple lines and a modern look to the Simmons midcentury kitchen. A touch of paint, new hardware, quartz countertop and new glass tile made this project a great success. Creating New During the project we helped create new space where we added an appliance caddy. What is an appliance caddy? It’s simply, a space designed to store appliances like blenders, toasters and food processers in an organized manner; that allows easy access and use of the appliances when needed. 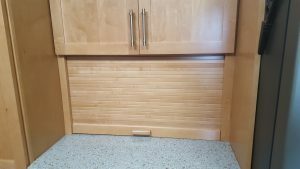 CLICK HERE FOR SAMPLE PHOTOS of other appliance caddy installations. The Remodeling Pro is proud to have been able to work with the Simmons on multiple remodeling projects. Thanks Again! If you like this kitchen or would like to discuss your kitchen remodeling options call The Remodeling Pro at (913) 268-9800. We promise SOLUTIONS, SERVICE & SATISFACTION.